The Newport Jazz Festival is a music festival held every summer in Newport, Rhode Island. Elaine Lorillard established the festival in 1954, and she and husband Louis Lorillard financed it for many years. They hired George Wein to organize the first festival and bring jazz to Rhode Island. 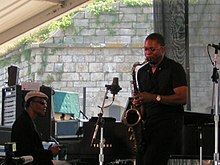 McCoy Tyner and Ravi Coltrane perform at the Newport Jazz Festival on August 13, 2005. Most of the early festivals were broadcast on Voice of America radio, and many performances were recorded and released as albums. In 1972, the Newport Jazz Festival was moved to New York City. In 1981, it became a two-site festival when it was returned to Newport while continuing in New York. From 1984 to 2008, the festival was known as the JVC Jazz Festival; however, during the economic downturn of 2009, JVC ceased its support of the festival and was replaced by CareFusion. As of 2012, the festival is sponsored by Natixis Global Asset Management . The festival is hosted in Newport at Fort Adams State Park. It is often held in the same month as the Newport Folk Festival. In 1954, the first Newport Jazz Festival (billed as the "First Annual American Jazz Festival") was held at Newport Casino, in the Bellevue Avenue Historic District of Newport, Rhode Island. It incorporated academic panel discussions and featured live musical performances. The live performances were set outdoors, on a lawn. These performances were given by a number of notable jazz musicians, including Billie Holiday, and were emceed by Stan Kenton. The festival was hailed by major magazines and newspapers, and some 13,000 people attended between the two days. In general, the festival was regarded as a major success. In 1955, organizers were planning a second year for the festival but needed to find a new venue. The Newport Casino would not again host the festival since its lawn and other facilities did not stand up well to such a large event. Festival backer Elaine Lorillard, with her husband, purchased "Belcourt", a large estate which was available locally, in hopes of hosting the festival there. However, the neighborhood disallowed that plan, citing concerns about potential disturbance. Consequently, the workshops and receptions were held at Belcourt, while the music was presented at Freebody Park, an arena for sports near the casino. Some Newport residents were opposed to the festival. Jazz appreciation was not common within the established upper-class community, and the festival brought crowds of younger music fans to Newport. Many attendees were students who, in the absence of sufficient lodging, slept outdoors wherever they could, with or without tents. Newport was at first not accustomed to this. Traffic gridlock and other contention near the downtown venue were legitimate concerns. Moreover, many of the musicians and their fans were African American. Racist attitudes were probably a factor in some residents' opposition to the festival too as it commonly was across the country at that time. Nonetheless, the festival continued annually and increased in popularity. In 1960, boisterous spectators created a major disturbance, and the National Guard was called to the scene. Word that the disturbances had meant the end of the festival, following the Sunday afternoon blues presentation headlined by Muddy Waters, reached poet Langston Hughes, who was in a meeting on the festival grounds. Hughes wrote an impromptu lyric, "Goodbye Newport Blues", that he brought to the Muddy Waters band onstage, announcing their likewise impromptu musical performance of the piece himself, before pianist Otis Spann led the band and sang the Hughes poem. The 1960 event was also notable for the presence of a rival jazz festival that took place at the Cliff Walk Manor Hotel, just a few blocks away. This was organized by musicians Charles Mingus and Max Roach in protest against the lower pay that the Newport festival offered jazz innovators in comparison with more mainstream performers; the fact that the innovators were mostly black and the mainstream performers mostly white was also an aggravating factor. In 1961, presentation of the official Newport Jazz Festival was disallowed, due to the difficulties associated with the previous year's festival. In its place, another festival, billed as "Music at Newport", was produced by Sid Bernstein in cooperation with a group of Newport businessmen. That festival included a number of jazz musicians but was financially unsuccessful. Bernstein announced that he would not seek to return to Newport in 1962. In 1962, the Newport Jazz Festival resumed at Freebody Park. Wein did not resurrect the extinct not-for-profit organization which had run the Newport Jazz Festival through 1960; instead, he freshly incorporated the festival as an independent business venture of his own. He was a music festival pioneer and would run many festivals besides the Newport Jazz Festival during his career. The 1964 festival was the last at Freebody Park, since the event had outgrown that venue also. Festival organizers saw a need to move the festival outside of the downtown area, since the festival-caused gridlock there was a contentious point in the community. A suitable site, actually a simple but ample field, which would become known as Festival Field, was identified, and the move was completed for the 1965 festival. Frank Sinatra played the festival that year, and new attendance records were set. The festival's 1969 program was an experiment in fusing jazz, soul, and rock music, and their respective audiences. Its lineup included, besides jazz performances, Friday evening appearances by such rock groups as Jeff Beck, Blood, Sweat & Tears, Ten Years After, and Jethro Tull. Saturday's schedule mixed jazz acts, such as Dave Brubeck and Miles Davis, with performers in other genres, including John Mayall and Sly & the Family Stone. On Sunday, James Brown was among those who appeared in the afternoon, followed in the evening by Herbie Hancock, blues musician B. B. King, and the English rock group Led Zeppelin. Davis remarked that the various artists involved were highly encouraging to each other and that he enjoyed the festival more than ever before. He also noticed and appreciated the spirited nature of the younger audience. But some clashes did occur. Excess crowds, estimated at 20,000, who had been unable to obtain tickets filled an adjacent hillside, and the weekend was marred by disturbances, including fence crashing and crowd surging, during the most popular performances. Saturday evening's disturbances were particularly significant, prompting producer George Wein, who feared a riot, to announce that the Sunday evening Led Zeppelin appearance was cancelled. That show was allowed to go forward as initially scheduled after much of the overflow crowd had left the city, following the cancellation announcement. For 1971, the festival booked The Allman Brothers Band, a Southern rock group. Many more fans were drawn than Festival Field could accommodate. On the second night, after the recording of what would become The Dave Brubeck Quartet featuring Gerry Mulligan - The Last Set at Newport, over 12,000 people on the adjacent hillside crashed the fence during Dionne Warwick's performance of "What the World Needs Now Is Love". The festival was halted after the stage was rushed and equipment destroyed. The festival would not return to Newport in 1972. In 1973 the festival was held at Fenway park in Boston MA, however the festival ended in an outbreak of violence, and the ballpark did not host another concert until 2003. In 1972, festival producer George Wein transplanted the festival to New York City, calling it the Newport Jazz Festival-New York. An expanded format involved multiple venues, including Yankee Stadium and Radio City Music Hall, and comprised 30 concerts with 62 performers including Dave Brubeck, Ray Charles, Duke Ellington, Roberta Flack, and Dizzy Gillespie. This format continued for the next years, but Wein missed the outdoors of Newport which the venues of New York City failed to duplicate. In 1977, Wein worked with the city of Saratoga Springs, New York, to move the festival to the Saratoga Performing Arts Center during the following year. He established the Newport Jazz Festival-Saratoga and remained in New York City, retaining the Newport Jazz Festival-New York in what amounted to an expansion. The Saratoga addition began a trend of using the "Newport Jazz Festival" name outside of Newport, as in the Newport Jazz Festival in Madarao, Japan, from 1982 to 2004. During the 1970s, the Newport Jazz Festival pioneered corporate sponsorship of music festivals. Working with Schlitz and KOOL, the festival changed its name based on what company was sponsoring. In 1981, George Wein brought the Newport Jazz Festival back to Newport, partly to preserve the Newport Jazz Festival legacy and to protect his interest in the Newport Jazz Festival name. Arrangements with the title sponsor of the Newport Jazz Festival-New York had seen that festival promoted as the "Kool Jazz Festival". It is notable that Kool cigarettes are a product of R.J. Reynolds', a competitor of the Lorillard Tobacco Company's, whose equivalent product is called Newport cigarettes. Newport, now quite keen to tourism, was extremely receptive to the resumption of its Newport Jazz Festival. The festival was immediately successful upon returning to Newport, although no longer quite the draw it had been in its first years, owing to shifting interests and to the proliferation of competing festivals. In early 2007, Newport Jazz Festival producer George Wein sold his Festival Productions company in a merger with festival producer Shoreline Media. The merger saw the creation of a new company, Festival Network LLC. That company now owns and operates the Newport festival and controls the legacy "Newport Jazz Festival" brand. Wein continues with the new company in a senior position but has a relaxed role in festival operations. Starting in 2007, the Newport festival began serving beer and wine at Fort Adams State Park. Two of the most famous performances in the festival's history are Miles Davis' 1955 solo on "'Round Midnight" and the Duke Ellington Orchestra's lengthy 1956 performance of "Diminuendo and Crescendo in Blue", featuring a 27-chorus saxophone solo by Paul Gonsalves. A reconstructed Ellington at Newport, from his 1956 performance, was re-issued in 1999. Aside from the actual festival performance of "Diminuendo and Crescendo in Blue", including the distant-sounding Gonsalves solo, the original album used re-creations, note for note, of some of the set's highlights, which were re-recorded in the studio. The new set restored the original festival performance after a recording from the Voice of America (which broadcast the performance) was discovered and, among other things, the odd timbre of the Gonsalves performance. Gonsalves, it turned out, stepped up to the wrong microphone to play his legendary solo; he stepped up to the VOA's microphone and not the band's. Gonsalves' performance so excited the audience that the festival sponsors feared that the crowd was on the verge of rioting. The 1957 festival was well documented by Verve Records, which released 12 albums of recorded performances. The 1957 performances of Ella Fitzgerald, Billie Holiday, and Carmen McRae were released on the album Ella Fitzgerald and Billie Holiday at Newport (1958). Those by the Gigi Gryce-Donald Byrd Jazz Laboratory and the Cecil Taylor Quartet featuring Steve Lacy were released on At Newport (1958). The performance of Count Basie was issued as Count Basie at Newport in 1958. Performances at the 1960 festival by Muddy Waters and Nina Simone were released as the albums At Newport 1960 and Nina Simone at Newport (1960). The 1962 Festival is documented in a film released by Storyville Records. Among the performers are Lambert, Hendricks & Bavan, the Oscar Peterson Trio, Roland Kirk, Duke Ellington, and the Count Basie Orchestra featuring Jimmy Rushing, at the closing. Part of the appearances by John Coltrane and Archie Shepp from the 1965 Festival appeared on the album New Thing at Newport. A set by Herbie Mann featuring Chick Corea, at that same year's festival, was released on the album Standing Ovation at Newport. Mann also released an album, mostly recorded at that performance, titled New Mann at Newport (1967). Albert Ayler's performance at the 1967 festival was released as part of the Holy Ghost: Rare & Unissued Recordings (1962-70) box set (2004). An Ella Fitzgerald performance from Carnegie Hall in July 1973 was documented on the album Newport Jazz Festival: Live at Carnegie Hall (1973). ^ a b Hevesi, Dennis (28 November 2007). "Elaine Lorillard, 93, a Founder of the Newport Jazz Festival, Is Dead". The New York Times. Retrieved 12 August 2018. ^ "Elaine Lorillard; helped start Newport Jazz Festival". The Boston Globe. December 3, 2007. Retrieved 2007-12-10. ^ "Newport Jazz Festival". APassion4Jazz.net. Retrieved 2010-08-24. ^ "2014 Newport Jazz Festival - 60th Anniversary". Newportjazzfest.net. 2014-01-21. Retrieved 2014-02-16. ^ Kenton, Leslie (2010). Love Affair. New York: St. Martin's. p. 225. ISBN 9780312659080. ^ "Newport Jazz Festival - Top musicians from Dixieland to 'cool' play concerts at staid resort". Ebony. October 1955. p. 70. "Over 13,000 enthusiastic fans turned out for last year's festival and this year more than 20,000 crowded the three evening concerts held in spacious Freebody Park." ^ Wein, George; Chinen, Nate; Cosby, Bill. Myself Among Others. Da Capo Press. p. 140. ISBN 0-306-81352-1. ^ a b "Newport Jazz Festival". Encyclopedia.com. Retrieved 2009-01-05. ^ Wein, George; Chinen, Nate; Cosby, Bill. Myself Among Others. Da Capo Press. p. 145. ISBN 0-306-81352-1. ^ "Newport Blues". Time magazine. 1960-07-18. ^ Balliett, Whitney (2000). Collected Works: A Journal of Jazz, 1954-2000. Granta Books. p. 124. ^ Anderson, Iain (2007). This is Our Music: Free Jazz, the Sixties, and American Culture. Pennsylvania: University of Pennsylvania Press. p. 51. ^ Ben Ratliff (2004-08-17). "CRITIC'S NOTEBOOK; 50 Years Later, Newport Swings With 'Real Jazz'". The New York Times. Retrieved 2009-01-05. ^ Avenengo, Charles. "Jazz Festival Golden Jubilee". Newport Harbor Guide - 2004. The Seamen's Church Institute. Archived from the original on May 16, 2008. Retrieved 2009-01-05. ^ Wein, George; Chinen, Nate; Cosby, Bill. Myself Among Others. Da Capo Press. p. 215. ISBN 0-306-81352-1. ^ Wein, George; Chinen, Nate; Cosby, Bill. Myself Among Others. Da Capo Press. p. 247. ISBN 0-306-81352-1. ^ Brennan, Matt (2006-03-24). Was Newport 1969 the Altamont of Jazz? The role of music festivals in shaping the jazz-rock fusion debate (PDF). Leeds, UK. Retrieved 2009-01-04. ^ "Led Zeppelin - Official Website". Retrieved 2009-01-04. ^ Ratliff, Ben (2005-06-14). "Singin' the Blues Before the JVC Jazz Festival". The New York Times. Retrieved 2009-01-04. ^ "Newport in New York". Time magazine. 1972-07-17. Retrieved 2009-01-04. ^ Wein, George; Chinen, Nate; Cosby, Bill. Myself Among Others. Da Capo Press. p. 412. ISBN 0-306-81352-1. ^ "George T. Wein Biography" (PDF). Festival Productions Incorporated New Orleans. Retrieved 2009-01-05. ^ Gennari, John (2006). Blowin' hot and cool: jazz and its critics. Chicago: University of Chicago Press. p. 246. ISBN 0-226-28922-2. ^ Clendinen, Dudley (1981-08-24). "After a decade, prospering Newport celebrates the jazz festival's return". The New York Times. Retrieved 2009-01-04. ^ Morton, John (2008-08-30). Backstory in Blue. Piscataway, NJ: Rutgers University Press. p. 262. ISBN 978-0-8135-4282-9. ^ Ratliff, Ben (2007-01-25). "George Wein Sells Company That Produces Music Festivals". The New York Times. Retrieved 2009-01-05. ^ Massimo, Rick (2007-07-19). "Newport music festivals to serve beer and wine". The Providence Journal. Retrieved 2009-01-05. ^ Avakian, George (1956). Liner notes to original release of Ellington at Newport. Columbia Records CL 934. ^ Schaap, Phil (February 1999). Liner notes to Ellington at Newport (Complete). Columbia Records / Legacy C2K 64932. ^ Newport 1962. Storyville. DVD. ^ "INFO - Newport Jazz Festival". Newport Jazz Festival. Retrieved 2018-08-29. ^ "INFO - Newport Jazz Festival". Newport Jazz Festival. Retrieved 2019-02-15. UPI (August 16, 1981). "The news at Newport: Jazz is back in town". New York Times. Wikimedia Commons has media related to Newport Jazz Festival.